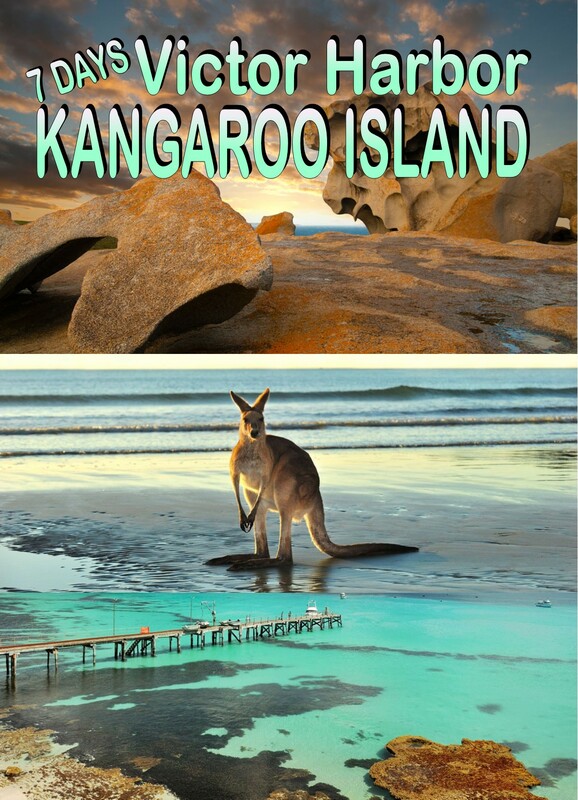 One of our most poplar itineraries enjoy the stunning views of Kangaroo Island & Victor Harbour. Welcome aboard for seven days of fun, adventure, relaxation and spectacular sightseeing. Today we travel along the Murray Valley Highway to Echuca for our first morning tea break.Continue on past the chain of lakes and onto Swan Hill for lunch. Then we make our way through the Mallee Region past the Hattah Kulkyne National Park, maybe see the delicate Mallee Wildflowers as we continue through Red Cliffs and along the Sturt Highway. We enjoy afternoon tea before crossing the South Australian border as we make our way to Loxton for our Overnight stay at the Loxton Community Hotel Motel. This morning we make our way via Murray Bridge before stopping at Strathalbyn for lunch. We then enjoy a scenic drive along the coast with panoramic views of Encounter Bay, Horseshoe Bay and the Old River Port of Goolwa. We see the fascinating Barrages that prevents the salt water from reaching the Murray River system and the Murray Mouth where the river meets the sea. We arrive in Victor Harbor where we enjoy a Unique Horse Drawn Tram ride (subject to availability) across the causeway to Granite Island. Then time to relax, explore the shops in this beautiful seaside resort before settling in for our Overnight Stay at the Motel Goolwa. Tonights Dinner is a 2 Course Meal. An exciting day awaits as we depart Victor Harbor, travelling the scenic Fleurieu Peninsula to the coast road that takes us to Cape Jervis, a small fishing village. We take our coach aboard the ferry for the short journey to Kangaroo Island. This unique Island is Australias third largest and is full of surprises and has a natural unspoiled beauty. Our adventure begins as we berth at the Township of Penneshaw, the location where Captain Mathew Flinders landed in 1802. Enjoy a town tour before we explore the Eastern section of the island taking in the Dudley Peninsula, with scenery varying from rolling hills to sandy surf beaches, sheer cliffs to tranquil backwaters with plenty of birdlife. We travel to the scenic Chapman River where we stroll down to the beach which reveals the startling splendor of Antechamber Bay. We continue onto Cape Willoughby Lighthouse, the first lighthouse built in South Australia. We cross the Wilson River and pass Mt Thisby, originally named Prospect Hill by Matthew Flinders. Then for something unusual we visit Robs Shearing Demo. Watch Rob and his dogs Billie & Toby as they skillfully muster and yard sheep before we make our way to American River. We settle into the MERCURE AMERICAN RIVER for the next THREE NIGHTS. Today we enjoy a magical day of highlights as we discover Kangaroo Island on our tour of Seal Bay and Flinders Chase National Park. Do not forget your cameras. We enjoy the Ultimate Wilderness Experience as we visit Seal Bay, where we discover Australias largest colony of Sea Lions. See them frolicking in the surf and basking lazily in the sun. Enjoy a delicious picnic lunch at the Rocky River Headquarters, located in the Flinders Chase National Park, this picturesque area provides an opportunity for close interaction with Kangaroos, Koalas, Wallabies, Cape Baron Geese, Bushtail Possums and Echidnas. After lunch we see a collection of huge boulders called Remarkable Rocks, sculptured into weird and wonderful shapes by the wind and sea. Visit the ruins of an early settlement at Weirs Cove before going on to Cape Du Couedic Lighthouse, built in 1906. See the magnificent natural land bridge that is Admirals Arch, look out for the New Zealand Fur Seals. We return through Yacca Flat along the West End and the Playford Highway to Kingscote. A relaxing start today as we have time to explore the shops in Kingscote before we discover more of Kangaroo Islands secrets. First we visit Cliffords Honey Farm and learn why it is the only place in the world where a pure strain of Ligurian Bee exists. Tour the honey room, see the extraction process and taste the many different flavours produced at the farm. Then we visit Emu Ridge Eucalyptus Distillery, where we learn of the distillery process still operating the way it began in the 1890s a unique Aussie Bush product. We travel to the township of Parndarna where we enjoy a picnic lunch and visit the Parndarna Wildlife Park, where we can stroll through the aviaries, the native animal enclosures and general farm animals. This afternoon we travel to Stokes Bay with its unusual walkway to the fine white sandy beach before continuing along the scenic North Coast Road as we return to our Motel. After a hearty breakfast its time to farewell Kangaroo Island as we make our way to Penneshaw where we board the Sealion 2000 again for our return journey to the mainland. We travel via the scenic Fleurieu Peninsula into Strathalbyn for lunch. We then travel to Kingston SE before arriving at Naracoorte for our Overnight Stay at the William Macintosh Motel. We enjoy the last breakfast of the tour before departing our motel and heading home via Horsham and Bendigo. We bid farewell to our new friends and return to our homes after a memorable Kangaroo Island tour.